Last New Year’s Eve we imagined attending an enormous dance party with beautiful mash ups and crossed our fingers in hopes to heave ourselves on stage to dance with the DJ; and we experienced it all. We spent the night picking up random noise makers and party hats along 6th street and ended up at the Mohawk where DJ Cars Stereo (Wars) threw down an awesome set. 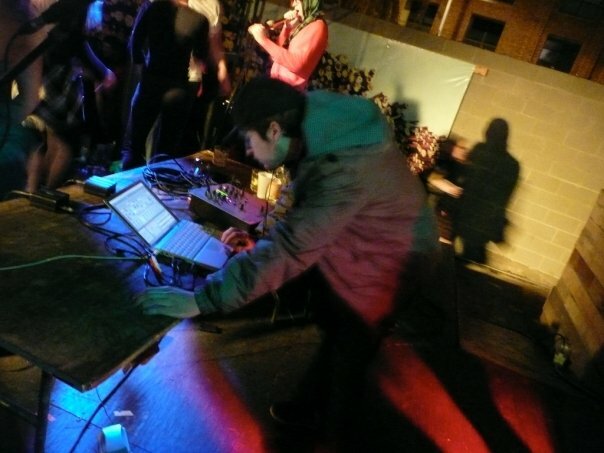 We knew CSWars music prior to the show, but we were stoked that he would be mixing the best of the best and creating the soundtrack for ringing in our new year. We jumped on stage and requested “Ghostface Observatory” which mixes Ghostland Observatory and Ghostface Killah; one of Merch’s personal favorites. At Fun Fun Fun Fest we were lucky enough to catch an interview with Chris of CSWars which we played on-air several weeks ago. If you didn’t catch it during our show, we will be posting the audio/video soon. To sum it up, CSWars will be performing THIS New Years Eve as well! Rare Magazine is continuing their live music stride with an event at the Seaholm Power Plant in Austin with performances by Flosstradamus, Car Stereo (Wars) and WOXY’s DJ SHIV. During ACL, the Power Plant was turned into a live music venue with a performance by Broken Social Scene. 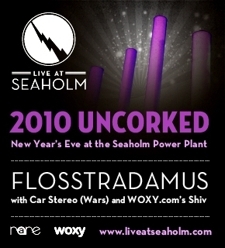 On December 31st the Power Plant will be transformed once again to celebrate Live at Seaholm: 2010 Uncorked, so make sure you check out the Web site for details. The tickets include complimentary hors doevres from Austin’s best restaurants, and champagne to toast at midnight. Lights shows and lounge areas, and a view of the downtown fireworks will set the scene for a brilliant dance party. Merch will be attending the event, so if you spot her taking photos or dancing like mad on the floor make sure to say hey! She will be posting awesome coverage of the event, so stay tuned.